Stevia has an ancient and venerable history in certain parts of the world. And, with leaves that can be up to 30 times sweeter than sugar Stevia is destined to find a place in the future of this country. With no calories and no reported side effects Stevia is an important herb for every home gardener. In Paraguay, where it has been used for centuries to sweeten the beverage mate, a tea made from the plant Ilex paragquensis, it is also valued for its medicinal properties. In Japan, where artificial sweeteners were banned by their Department of Health, Stevia accounts for almost half of the sweeteners used. In America, Stevia is new and this requires that American growers learn how it behaves in our gardens with our soil and our sunshine and at our latitudes. And, like much information about herbs that has been erroneous in the past (Epazote being an annual springs to mind), there are bound to be some adjustments in the literature yet to come. For instance, Stevia plants are rated to Zone 11. This should mean that at 32 degrees it is a goner. But, so far, for us, it has behaved more like a herbaceous perennial. This means that, in our Zone 8, these plants have died back to the ground and returned with spring. We have found no other literature to support this and, since we have only a few short years of data, we continue to maintain that Stevia is a Zone 11 plant. This means it cannot survive freezing. In a way, it makes sense that Stevia plants would be tender because, after all, it is native to Paraguay where its climate ranges from tropical to semi tropical. In David Richard's book, Stevia Rebaudiana, Nature's Sweet Secret, he states that the average temperatures where Stevia is found growing ranges from 21 to 110 degrees and that these areas are semi- humid with soil that is acidic and well draining. Yet, the plants have survived brief dips below 21 degrees, grown very well in our arid summers, as long as adequate water is provided, and shown great tolerance for our alkaline soils. Those that have done well here have been heavily mulched with small bark chips, which contributes to the acidity level of the soil. And, while we have not fertilized the plants in the garden, we do garden organically, which continually maintains the health of the soil and provides excellent drainage. 1. Plant outside after all danger of frost. 2. Place in six to eight hours of sun. 3. Mulch with compost or bark up to three inches deep and two feet in diameter. Make sure to leave an open collar about two inches wide around the small plant at first. 4. Keep plants well irrigated. 5. Harvest small amounts often or cut bush to about two inches above the ground in early summer and again in late summer/early fall just before flowering. 6. In cold areas, bring plants in and place under 14 hours of fluorescent lighting hung three inches above the plants or treat as an annual. 1. Add several leaves to any cup of hot liquid. Approximately 3 tablespoons chopped fresh Stevia equals one cup of Sugar or 1 teaspoon processed Stevia extract powder. Bring water to a boil and turn off. Pack tea ball with leaves. Steep leaves in water for 30 minutes. Add this liquid to foods where the green appearance would be unwelcome. 1. Dry in a warm dark dry area. 2. Grind dried leaves to a fine powder with a small coffee/spice grinder. 3. Store in an airtight container out of light. 4. 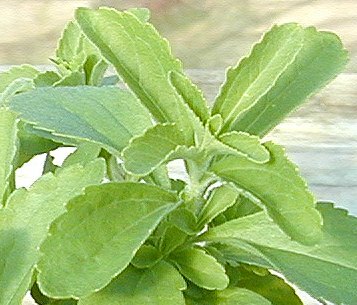 Approximately 1 tablespoon of dried Stevia powder equals one cup of sugar or 1 teaspoon processed Stevia extract powder. 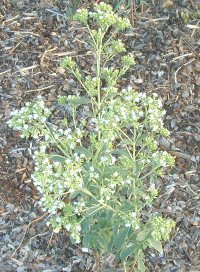 Sweetness of leaves vary, so quantities of dried Stevia powder needed may vary. There is definitely room for experimenting with Stevia in different proportions and different foods. It should not be thought of as just a substitute for sugar. Its unique flavor adds an earthiness to other spice blends as well. Try Monster Cookie Balls OR Chilled Apple Pie! Stevia makes a great addition to our Small Space Herb Garden Six Pack. This plant is sometimes available in plug trays. These trays hold 128 of all the same plant. They are a great low cost way to fill a lot of space. Each cell is 3/4 of inch by an inch. 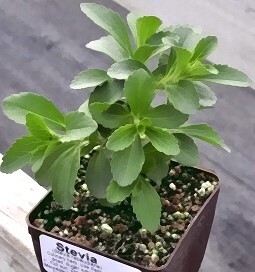 Check here to see if Stevia Plug Trays are available.